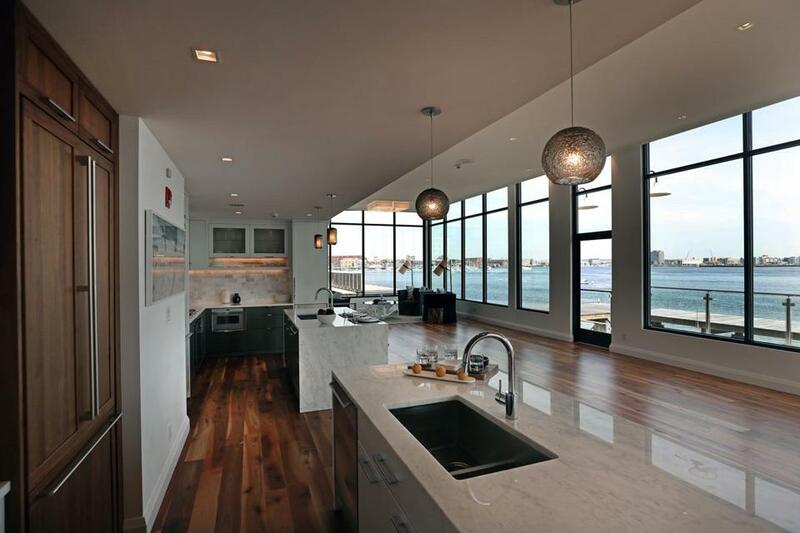 Pier 4 model home interiors with two different styled kitchens and view of Boston Harbor. By the time I got to the master bath, with its radiant-heated floors, free-standing egg-shaped tub I initially mistook for an art installation, and a $63,000 slab of marble topping the two-sink vanity — so buttery it looked poured — I was almost crying. The marble, of course, and also the condo’s cove ceilings, whatever those are, and a personal rotunda, and a private elevator that opens right into my foyer, and beyond that, a life that is discreet and curated and staffed with smiling folks delighted to walk my dog on a day that is too cold for me to go out myself even though I own a wardrobe of Canada Goose, and so free from financial concerns that I’d laugh at a condo fee that could hit $15,000 a month. At One Dalton and Pier 4, the pricey new buildings are all about gleaming windows, five-star service, and indoor-outdoor living. 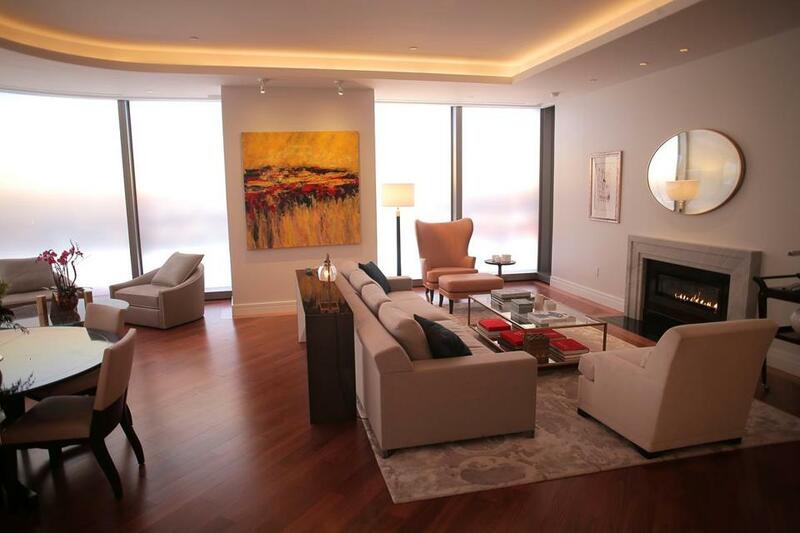 The living room at One Dalton. Boston, where money once prided itself on being understated, has gone Kardashian. The pricey new buildings are all about gleaming windows and five-star service and indoor-outdoor living once associated with LA, not the Hub. 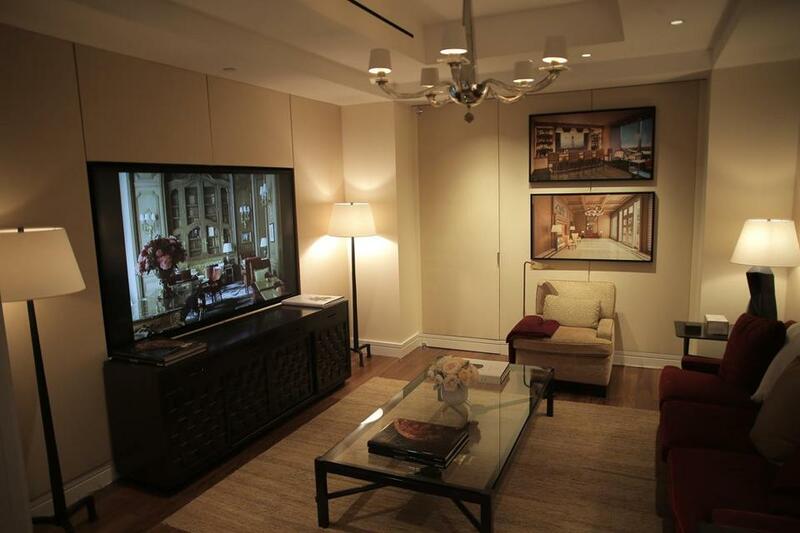 Wouldn’t you want to weep, too, if I told you that the developer building One Dalton, the Back Bay residential tower where a penthouse reportedly sold for $40 million, spent $7.5 million to construct a temporary showroom? It’s not even a real living space — it’s a model constructed on the second floor of the Four Seasons Hotel Boston across from the Public Garden. But consider: 6 miles away, in Mattapan, that same money would buy 20 single-family homes, according to 2017 median sales figures from the Massachusetts Association of Realtors. How would you feel if I told you that Pier 4, the luxury building rising on the old Anthony’s Pier 4 site, where the 10 penthouse homes go from $7 million to $14 million, has a concierge who works full time at the development already — in the showroom? Jeremy DiFlaminies is going to be the concierge for the real building, too, when that opens next year, but having him onsite now is nice, Janice Dumont, CEO of Advisors Living, told me, so he can get to know buyers’ preferences — for restaurants and wine and florists, etc. — a year before they move in. The master bath at One Dalton. I turned my head and wiped a tear, realizing that no one is eager to learn my preferences (although to be honest, with two teenagers, a dog, and a full-time job, at this point even I don’t care about my preferences). My ultra-luxury tour had taken me to Pier 4’s newly constructed 3,000-square-foot sales gallery, which is so close to the water you could be on your yacht. The harbor sparkled through the enormous windows. The shelves in the high-end fridge glided up and down at a mere touch. Dumont apologized that the virtual reality program, which lets prospective buyers “walk” through their residences, was undergoing a technology upgrade. We put on our gleaming white, custom-made Pier 4 helmets and walked to the construction site to check out the views from the penthouses. Some prospective buyers are so enamored with the helmets they want to keep them, Dumont said (and they can!). On rainy day tours, she added, buyers can borrow (or keep!) a pair of the high-end Hunter rain boots Pier 4 keeps on site, in every size. “It’s Pier 4 bling!” she chirped. I inhaled the “island grapefruit” candle — it’s $65, Dumont said — and I thought about my own house-hunting experiences, which have typically featured a real estate agent who did not: offer me champagne; describe an “amenity package”; paint a picture of the new me that would emerge if I bought into a building with a golf simulator and in-home botanical care. Closets in the master suite at One Dalton. 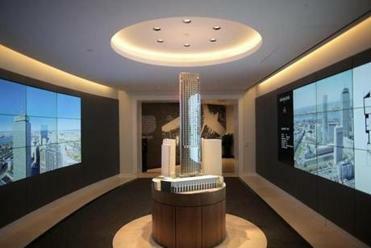 At EchelonSeaport, another luxury property under construction, the director of sales for The Collaborative Companies, Patrick Cutter — a veteran of the high-end Millennium Tower project — described the evolution of selling high-end real estate. So what is that lifestyle? This is not how the salespeople put it, but after listening to the pitches, here’s what I can tell you. It’s a life where every need is handled. You live in Boston, but a Disney version. If all you knew of the city was what you saw in the marketing materials, you’d think the entire town consisted of: athletes rowing on the Charles; slim people laughing at some unheard joke; indoor-outdoor furniture, pools, and fire pits; and Harvard. But even as they sell Boston hard, a parallel part of the developers’ pitches involves never needing to venture outside your cloistered neighborhood in the sky and actually going to Faneuil Hall (thank goodness) or interacting with actual Bostonians. A room devoted to interior designer Thierry Despont. The new luxury buildings tout in-house gyms and therapy rooms, private spas and pools, screening rooms and, in some buildings, a place for your dog to go the bathroom indoors. At One Dalton, where the residences will be above a new Four Seasons hotel, the amenity package includes “service closets,” two-doored spaces that allow a service person to drop off your package via one door, and you to retrieve it, privately, through the second door. At Pier 4, there will be a “runner” on staff. “If you forgot hairspray, they’ll go off premises to do an errand,” the PR person said, as I stifled a sob and realized I am my own runner. Correction: An earlier version of this story incorrectly stated the title for Janice Dumont. Dumont is CEO of Advisors Living. Beth Teitell can be reached at beth.teitell@globe.com. Follow her on Twittetr @BethTeitell.